Despite the monsoon outside, the Transportation, Parking, and Pedestrian Committee (TPPC) of Virginia Beach's Resort Advisory Commission (RAC) met on Thursday morning. With today the final day of seasonal VB Wave service, the numbers through September 27 were reviewed. Ridership for the season is up 6.1% over 2009, with Route 32 (Shoppers Shuttle) leading the way with a 14.0% increase. Also, Staff was instructed to look at possible improvements for the Rudee Loop Transfer Center and report back with them at the October TPPC meeting. The TPPC requested a Briefing on the three finalist mass transit routing options between Birdneck Road and the Convention Center. That may also happen at the October meeting. A signage inventory was previously asked for in the Resort Area, with the goal of reducing the number of traffic signs to eliminate clutter. However, the fledgling initiative has now snagged on methodology. Finally, an outline on all pending transportation projects in the Resort Area was presented. The list will be updated every six months for the TPPC. "We Told You It Was A Marxist Conspiracy!" To aid movement of people using Norfolk's light rail system during the opening week, Hampton Roads Transit (HRT) will have a volunteer force to be known as the Tide Guides. They will be goodwill ambassadors, answering questions and giving directions. I can't wait until the extremist Virginia Beach Taxpayers Alliance (VBTA) learns that the Tide Guides are slated to be wearing red shirts. 81% of you who voted oppose ABC privatization, while 19% support it. Anyone who has been reading the minority media on the issue should know the only way a privatization plan will make it through the Democratic-controlled Senate is if it simply privatizes the existing ABC stores. Any plan that could result in a proliferation of liquor sales in poor minority neighborhoods will be fought to the death by the Black Legislative Caucus. The previous poll question sat up closed for over 36 hours because - to be honest - I was trying to think of a new question. This morning I received an e-mail on regional policy, so that's where we'll go. Should we consolidate local governments and services, services alone, or have no consolidations at all? The Transportation District Commission of Hampton Roads (TDCHR), the governing board of Hampton Roads Transit (HRT), met on Thursday afternoon. In it's most important piece of business, it's participation in the purchase of the Virginia Beach portion of the former Norfolk Southern Right-Of-Way was unanimously approved. All that now remains is for the lawyers to sit down and finish the final papers. The Commission held a lengthy discussion on financing operations. Measures are going to be taken that will cut HRT's annual interest paid on it's Line of Credit at least in half. Through two months of FY 2011, HRT is nearly $1.3 million under Budget. Two other contracts of note were approved. 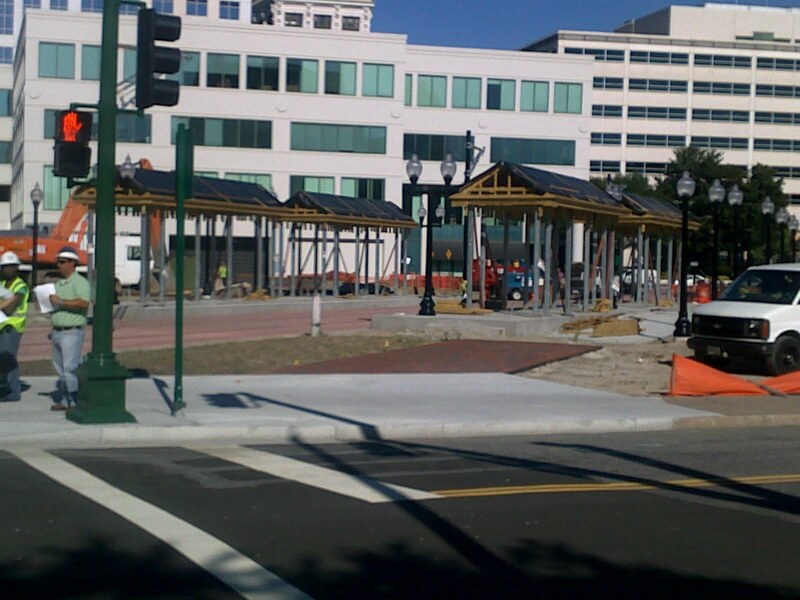 First, signage for light rail stations and new bus stop signs throughout the system was approved. The new bus stop signs will also have on them schedule information for that particular route. Second, a Change Order for electrical systems on Norfolk light rail was approved. While more than the original project estimate, it is "several hundreds of thousands of dollars" less than the figure in HRT's $338 million cost to complete. The Tide is now 93.2% finished. With the previously mentioned electrical contract (the only major snag on the radar) now taken care of, construction can roll. Finally, no one came and signed up for the Public Comment period. My fellow bus riders, I know you have issues with the system. However, in about four scheduled Public Comment periods now, no one has shown up to speak out. You have the Commissioners and senior Staff all in one room, so take the opportunity to bring matters to them. The TDCHR schedules at least four such sessions annually, two on each side of the water. With it being a Census year, legislative bodies will be redistricted next year based on the latest Census information. The House of Delegates process has begun, with Public Hearings being held around the Commonwealth. On Wednesday evening the Hampton Roads Public Hearing was held, at the Roper Center for the Performing Arts in downtown Norfolk. A few common themes came out of the comments. First, citizens want legislative district lines to respect city lines as much as possible. South Hampton Roads has about a half-dozen districts that cover three jurisdictions. Second, districts should be compact and contiguous. Third, redistricting shouldn't be aimed at incumbent protection. Some speakers addressed the possibility of a bipartisan or nonpartisan commission to draw the redistricting plans. Personally, I believe the flaw in the logic is the assumption that moving the process to a commission would somehow take the politics out of the process. If you believe that, I have a bridge to sell you. Chris Jones stated that the Norfolk Hearing drew about twice as many people as the one in Roanoke. The intriguing part is that chairs for the public were put on the stage with the Delegates and Staff. The majority of the public sat there, though the seats were quite uncomfortable. Yesterday I made my third trip to Williamsburg via mass transit. I went out to New Town to see a matinee showing of The Town, a great movie. Like my previous off-season trip. service on Williamsburg Area Transport (WAT) left me gushing. The Summer tourist season strains WAT. However, riding WAT in the off-season versus riding Hampton Roads Transit (HRT) is effectively the difference between flying First Class (WAT) and Coach (HRT). I hope that HRT doesn't absorb WAT through some merger in the name of Regionalism. That would destroy the better culture. Michael Ragsdale of HR Transit Ideas once told me the only time in his life he was sad to see a HRT bus was when the 121 arrived at the Williamsburg Transportation Center (WTC) for the express run out. (Route 121 is a weekdays rush hour only express bus between WTC and the Newport News Transportation Center via Patrick Henry Mall.) WAT had pampered him so much he knew it would be a letdown to get back on HRT again. Phillip Shucet will probably leave HRT next year, with a CEO search committee already having been formed and held it's first meeting. I certainly hope the TDCHR takes a close look at WAT's Mark Rickards as the potential replacement. On Thursday evening the Thalia Civic League held a City Council candidates forum at Thalia Trinity Presbyterian. Between working all weekend and trying to decide how to format this one (5 pages of notes from a dry format), I hadn't posted yet. In the end, I figured I'll just grade out each candidate's performance. Thalia had a reputation for being VBTA Lite, but the tame format brought forward under Program Director Mac Rawls (yes, that Mac Rawls) meant no fireworks this year. Each candidate had five minutes for an opening stump speech. Two questions were then posed by Moderator Barbara Ciara (light rail, and the schools budget surplus funds moved to the City side of the Budget), then one minute for closing remarks. Dave Redmond - tugged heartstrings speaking on his ties to Thalia, and deftly deflected Toni Hedrick's criticism of the 85/15 Property Tax ratio. Superb job. Andrew Jackson - a very good night, as he was congratulated by residents in the foyer outside afterwards. He also had the second largest campaign staff contingent there. Jim Wood - very articulate, as usual. That, coupled with Toni Hedrick's dismal performance (more later), should win him Thalia easily. John Uhrin - for all the times I've heard him (i.e. RAC, TDCHR, Council Retreats, etc. ), Thalia was the sharpest I've ever seen Uhrin. Kudos for coming even when running unopposed. Louis Jones - sounded like a 2004 incumbent, going on about past accomplishments. What are you going to do in the next four years? Given that only a nuclear-level implosion would cost him this election, he didn't do anything to hurt himself. Rita Sweet Bellitto - the civil engineer covered how she has helped with past projects (Lake Gaston pipeline), and can help with new ones (light rail). However, what's the compelling case for electing her to a full term? James Cabiness - a good job by the first-time candidate. Tanya Bullock - a very good job, except telling the same lame joke twice. She had the largest campaign contingent there. Barbara Henley - her pet issues don't play well to a neighborhood like Thalia, but (like Louis) she didn't hurt herself. Wally Erb - tried to sound centerist, twice going on about the need to staff city services. John Moss - essentially the same candidate you saw in 2004 and 2008. With no new wrinkles, how does he expect not to lose again? Bill DeSteph - showed up late, missing his original five minute slot. He might as well have stayed home. The lack of substance by someone who has been on Council for four years was stunning. Toni Hedrick - she couldn't have been much worse. First, she was reading her five minute from 8 1/2 x 11 sheets she was holding up in her face, the only candidate reading her stump speech verbatim. Second, the remarks sounded like they had been cut and pasted from VBTA Statements: homeowners are the economic engine of Virginia Beach, light rail won't reduce traffic congestion, attacking the 85/15 residential/commercial Property Tax revenue ratio, etc. Third, she stated that from reading the 1999 light rail proposal that she found the only reason for LRT was redeveloping the Strategic Growth Areas. (Uh...the SGAs weren't established until 2003.) Fourth, she thought we could become an economic development mecca if we simply phased out BPOL and the Machines & Tools Tax. (Never mind transportation, education, etc.) I could go on, but you get the idea. Also in attendance were a few School Board candidates, previous Mayor Meyera Oberndorf and her husband Roger, and political consultant Brian Kirwin. As I could see Kirwin making an audio recording of the forum, any opposition candidates can and will have their remarks used against them. On Wednesday the Transportation Planning Organization (TPO) held it's September meeting. During the Public Comment session, a number of speakers came forward in support of extending the consultant's contract on High Speed Rail. The contract has now expired. An engineer from VDOT came to give a briefing on the state study to increase capacity at the Hampton Roads Bridge-Tunnel (HRBT). The $5 million study was ordered by Richmond without any input by the TPO, which is on record favoring The Third Crossing to increase capacity across the harbor. Mayor Paul Fraim of Norfolk led the charge against the initiative. The Port of Virginia representative pointed out that any construction to increase capacity at the HRBT would probably require lane closures. Therefore, it was preferable to build The Third Crossing first in order to provide a detour during any HRBT work. On High Speed Rail, a Phase II of the Vision Plan is being looked at. The primary issue is the scope of any new contract, then there would be the need to negotiate terms based on that scope. Finally, the draft project prioritization tool is now scheduled to come to the TPO in December. Staff still has more work to do, then the TPO's three advisory committees will all be asked to weigh in on it in November. In our latest poll, 76% want to move the radar at Oceana that is responsible for seeing our coast for defense. 24% were opposed. Personally, I don't see how we avoid moving it by the midterm. It's funny to see the same buffoons who wanted to run Oceana out of here in 2005 rather than meeting the BRAC terms now trying to wrap themselves in the flag and masquerade as the defenders of Oceana. Opposition to moving the radar, for the most part, is nothing but political opportunism. The new poll question: should ABC sales be privatized? When Wally Erb ran for Clerk of the Circuit Court in 2003, he tried to coattail on the previous year's transportation referendum defeat. Like the Axe The Tax Campaign, he used white on red signs with the slogan "No Tax Increase". Taking the Route 25 towards the Municipal Center yesterday afternoon, I saw Erb's City Council yard signs up in his home neighborhood. They were burgundy and gold. Last night at City Council, he was handing out similar cards, with the 2010 Redskins season schedule on the rear. Of course, Wally is from the Bronx, Giants and Jets territory. A three-time (soon to be four-time) loser trying to coattail on a bunch of losers. Norfolk Southern ROW Deal Passes 10-0! This evening the Virginia Beach City Council voted 10-0 to purchase the Norfolk Southern Right-Of-Way, a potential mass transit corridor that runs in a straight east-west line across our city. Rosemary Wilson was absent. It was the first public show of strength by Light Rail Now (LRN), with supporters wearing Light Rail Now lapel stickers. Online threats by the opposition prompted LRN to mobilize. Speaking of the opposition, Robert Dean was the only major VBTAer front and center. (Afterwards I saw John Moss outside the Council Chambers.) Mostly a cast of characters no one had ever heard of. Not only did they overstate what was on the line tonight, but made some ridiculous statements during their remarks. As I said later, "They threw their third stringers at us and we chewed them up." Three television cameras were there: WAVY, WVEC, and one I couldn't identify. Andy Fox came over after I spoke, got the spelling of my name right, and looked at the written text of my remarks. Hey, I may be on Channel 10 later. Shortly after my remarks to Council, a VBTAer came over and called me a "no damn good bus rider." I'm tempted to use that quote on the blog banner. D. J. Spiker of the blog Bearing Dirft posted a link to this Huffington Post video on his Facebook feed. I embed what may be one of the craziest political speeches you'll ever see. 1. 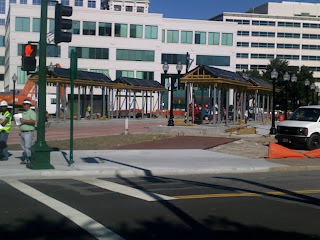 I took this picture of MacArthur Station in downtown Norfolk this morning. Construction is putting up the station itself. Note the crew powwow going on, partially caught in the lower left corner. With the day free, I went downtown for a haircut & beard trim, lunch, and a movie. The Other Guys was quite hilarious at points. 2. TMD is here and is starting work on the Efficiencies Study for Hampton Roads Transit (HRT). They arrived today and had an all-day work session with HRT's Planning Department. I found out by chance: leaving downtown, I ran into them being given their introduction to the Cedar Grove Transfer Center. They managed to finish before the Outbound 23 (to my beloved Walmart on Military Highway) arrived. Among those who attended last night's CCO meeting was Virginia Beach Taxpayers Alliance (VBTA) Maximum Leader Robert Dean. He arrived late, and sat in the rear. Towards the end, he rose to give a farcical speech. 1. He began with his usual anti-tax gig, going on how taxation was slashing our disposable incomes. Nothing new. Any anti-taxer could have given it. 2. He then attacked light rail. He went on how a few times this year the VBTA had contacted the CCO Board of Directors about opposing it, only to be rebuffed. What was Dean expecting? The Board to be shamed and come out against it now? The civic league representatives to be appalled by the Board's actions and rise up against them? If Dean hasn't noticed, the CCO has a representative on the Light Rail Now (LRN) Board of Directors. Also, two other CCO personalities sit on the LRN Board. It's far more savvy to be sitting at the table helping craft a proposal, than to be on the outside screaming like raging lunatics. The telling thing: Dean's rant was met with a yawn. Everyone in the room was civicly active. If they embraced the VBTA's beyond the pale extremism, they'd join the tiny breakfast cult. They don't join because they recognize the VBTA as a collection of racist kooks. The bigger issue is that while the VBTA claims "We are the people", the CCO isn't even singing the same gendre of music. The lays the lie to the VBTA's claim to be the real representatives of the residents. The VBTA has looked upon the CCO as a threat, trying to plant VBTAers on the CCO Board. This evening was the September meeting of the Council of Civic Organizations (CCO), Virginia Beach's civic league federation. With it City Council election season, some candidates showed up to campaign. Beforehand, Tanya Bullock, James Cabiness, Toni Hedrick, and Bill DeSteph were there. John Moss showed up late and spoke to people as they departed. Prior to the meeting, Toni Hedrick walked over to where I was seated and handed me her campaign card. I was wearing my "I (Heart) Light Rail" t-shirt. In our latest poll, I asked who was your first choice in the Virginia Beach City Council At-Large contest field. With a new record of 220 votes cast, Dave Redmond won with 40% of the vote. While Andrew Jackson will be my first vote, as he's the candidate who would push Virginia Beach towards where it needs to be in the future, I'm leaning towards Redmond as my second vote in that he's the best-suited towards managing today's problems. In 2nd Place was Wally Erb at 31%. Wally pushed trying to get a light rail referendum question on this November's ballot, claiming it was simply to give the public a vote...but admits he'd campaign against it in a referendum campaign. Wally is a Libertarian who decries subsidies...but is pushing a "Tricare/Medicare Initiative" that would have the City's General Fund subsidize his doctor. Does the Erb Campaign logo have two pictures of him, one of each of his faces? Surprisingly, James Cabiness finished 3rd at 18%. I'll take a serious look at him if Redmond disappoints. Andrew Jackson and Rita Sweet Bellitto each got 4%, with John Moss at 2%. Bill DeSteph finished last with three votes. Was that Bill, his girlfriend, and his girlfriend's mother? The new poll question: should the radar at Oceana be moved? Taller buildings in the Resort Area are and would obstruct it. Despite the approach of Hurricane Earl, Virginia Beach's Resort Advisory Commission (RAC) met this afternoon for about an hour. First there was a Presentation by the City's Special Events And Film Office (SEAFO). Overall, special events in the Resort Area continue to mushroom, accounting for 65% of the City's total in 2009. (Special events in City parks outside the Resort Area fall under the Department of Parks and Recreation, and aren't counted towards the total.) As of August 27, in 2010 there have been 292 Resort Area special events, 151 non-Resort, and 18 films shot. The Oceanfront Enhancement Committee (OEC) reported on the parking meters for homeless funds program. 7 meters have been installed along the Boardwalk, with 6 sponsors so far. The Plan/Design Review Committee (PDRC) reviewed 5 projects, with 3 of note. First, another look at Beach Centre at 31st Street and Pacific Avenue. Second, a proposed new restaurant (to be named "Eden") in the old brick post office on 32nd Street. (Psst...the VBTA will believe it's part of a conspiracy when they learn Runnymede Corporation now owns the building.) Third, the proposed Ocean Sky Retail Center, which would go where the Viking Motel now stands. Not meeting during the past month were three RAC committees: the Transportation, Parking, and Pedestrian Committee (TPPC), the Resort Investment Committee (RIC), and the Communications Committee. The American Music Festival is scheduled to go on this weekend, but with a delayed start on Friday night. (Commissioners were told 8 P.M., with hamptonroads.com now reporting gates will open at 6:30 with shows starting at 7:45.) The worst of Hurricane Earl is suppose to be over by Noon, with winds down to 10 mph by 5 P.M. Setup crews are slated to get to work at 2 P.M., and should have the basics up in time. By Saturday night's shows, concert goers shouldn't notice anything different from previous years.